When Steve was diagnosed with ALS in February, 2011, we went to a restaurant on our way home, and through our tears, clinked our glasses to Life! We declared that, while ALS is not from God, this sudden and unexpected move into a new community was certainly His plan for our lives and we decided that we would not go kicking and screaming, we would go loving and serving. Because the disease is rare, our “country” isn’t very big. We rarely run into people with ALS (we’ve once or twice asked people in wheel chairs if they have it – we stopped doing that because the look of horror on their faces just reminds us that no one wants to visit our country). When we do meet someone living in the land of Lou Gehrig, it’s like finding a fellow sojourner on a long journey and you feel not-so-alone. When we arrived at the ALS conference last week, I imagine it was like someone from Finland stumbling into a hotel ballroom in Arizona and finding a thousand people from Helsinki there. Everyone speaks the language. They understand the street names from back home. They know the same food and they have lived through the up’s and down’s of a culture that the rest of Arizona couldn’t possibly understand. That’s the best way I can explain our week: it was like finding your country, comfort and comrades…all in one space. I arrived late because I had been speaking at a conference, and so I was almost immediately whisked off to a candlelight tribute rally. This rally was attended by hundreds of PALS and FALS and it was very moving. A woman shared the story of her brave husband who faced the disease with valor and grace. She talked about how their marriage grew stronger as a result of the disease as did all of his relationships. He slowed down and invested in people and his life really mattered. A man shared of his grandmother – a former dancer – who died of ALS years ago and he has given himself to the fight. And a 13-year-old boy shared about losing his dad just a few months ago and I would tell you what he said but…it’s still just very deep and raw for me. It was beautiful, though. Vikings: like pirates, but cooler. I’m astounded that people as smart as these doctors have any room in their brains for humor, but there it is. After that session, was one on Clinical Research Trials. This is where we ran into some dangerous, difficult terrain in our country. A panel of researchers explained the breakthroughs on the horizon and the tests being conducted to verify the effectiveness of new treatments. They spoke of possibilities and complications and the astronomical odds of making a treatment actually work. I appreciated their candor and I know they are working so hard to eradicate this disease, but I have never felt despair rise so palpably in a room before. A man took the mic and talked about a clinical trial he participated in and received some help from, but now he cannot get the medication because it’s not yet approved and his condition is rapidly declining. He begged the doctors to find a way to make the treatment available. A woman spoke of her son – still in his early 20’s – who cannot qualify for a trial of any kind. It was at this point that a woman with ALS at a table behind us began to cry. Not just cry, but sob…soul-deep, gut wrenching sobs that neither she nor her friends could contain any longer. It was the desperate cry for help for which there were no adequate words. It was the cry for deliverance from a land she never wanted to visit and now she knew she would probably die there. The doctor tried to be heard over her weeping, as he carefully explained that we are far from knowing what we need to know but they are working as fast as they can. A long dinner with our team of superheroes – each of whom has lost someone dear to them to ALS, each one so familiar with the soil of our battleground – restored hope and rest to me. We laughed and ate and carefully remembered everything promising that we had heard that day. We planned our attack on Capitol Hill, where we would – with more passion than ever – ask our government to please help us in this fight. I’m so thankful to Aubrey, Carolyn, Barb, John and Beth for helping me find solid ground again. And you know who else I’m thankful to? I wish I could explain how he really is when no one is looking. I wish I could show you how brave and strong and righteous he has been in this fight. He is valiant. He is so many things that I am not and while this disease attacks his muscles, he still carries me along pretty effortlessly. I am thankful that I even get to know him…being loved by him so well for so long is a gift beyond telling. So, I promise tomorrow I will turn this blog around. Good things happened on Capitol Hill and I can’t wait to tell you about them. But I wanted first to be very honest because I’m guessing you might also live in a land you didn’t choose. You may have built a home in heartache or disappointment or struggle or pain and you are longing for a miracle of Exodus proportions. I am longing too. But I know He is enough. I know that He also has a home in our grief and He doesn’t ever make us go alone. He always reminds us that a better day – and a beautiful home – is coming. Susan from Nebraska - You said it all so beautifully Bo. I felt like I was right there with you. But God…..I thank Him for His hope no matter what we face. I love you and Steve for living for Him and seeing Him in your life no matter what others would see. You can bring Hope to the Hopeless because you are actually living in His Hope! Give Steve a great big hug for me!!! sara - One of my hardest struggles through life and my Faith and getting closer to God was assuming he had planned this horrible life for me and wanted nothing good for me. After being sexually exploited for so many years I was sure God had no plan or love for me. I hopeless. Lost. Until, I met a woman who didnt even know me and she walked up to me just to tell me God wanted her to let me know, that every bit of trauma I went through, He was RIGHT THERE HOLDING MY HAND THROUGH IT ALL. Her words brought me to tears. Yes, God was there and I finally started to realize why He let me go through such evil. He had a much bigger plan for me, one that would allow me to be a voice and speak to my experiences and help any way I could. I admire you both for this journey has been tough….however, I guess the moral to all of this is He is WITH YOU BOTH holding your hands, walking beside you. There is much bigger plan to all of this. I am sure. Love you both, my prayers are with you guys. Tess - Love this post. Love my mom. Love my dad. Not a fan of ALS. Really like viking/pirate comparisons. I’m thankful you wrote this. I can’t wait to squeeze you. Gail gumpert - As I read your blog , I so do not like the country that we have to through sometimes, but it does make it easier with His love wrapped around us, no matter what!! You are an amazing lady and am proud to be your friend! Bo - Thank you, Jill – we love YOU. Bo - Love you, Gina B! Bo - Aw…this little comment made ME cry at dinner. I miss you, missy – so, so much. Bo - Yes, friend, let’s make the coffee & squeezin’ happen soon. Bo - Thank you, Gail! So glad for your friendship. I’m thankful you’ve tweaked your attitudes (cause let’s face it you could be visiting “I’m so sorry for myself land”) and made a choice to be a beautiful broken blessing. Your brokenness ends up being transformed into a HUGE blessing to others as you continue this walk of faith in the midst of a strange land. Prayers and hugs to you both! bo - Love you, Sara. Wanted to let you two know how much you are loved. Looking forward to seeing you when you get Home. Edie - I am always amazed at your way with words. So very perfect. And amazed at how beautifully you are walking through this land you’re in. Love you both. Big hugs. sue marken - My life is more enriched being back in touch with you and Steve. Incredible people you are. My heart was touched by your words and I often find myself praying for the two of you. Sending love and admiration your way. Molly - Words can’t express emotions most of the time…..you do better than most though……I am not able to express mine to you right now…..other comments are all true, but I can’t find words beyond those…..for what wells up in me when I read your blog. However, I do believe that God will somehow help you know our love for you both….the depth of it. Hugs to you, steve, AND the kids. bo - Thanks, Julie – my attitude require lots of tweaking lots of the time. 🙂 I’m really glad that God is patient! bo - Bless you, L & C – love you lots! bo - I appreciate you, Edie-friend! bo - Aw, Sue, thank you so much. You guys are a blessing. bo - Yes, Molly, He is absolutely show us His love through all of you – in such big & beautiful ways. We love you so. Jane Williams - The amazing thing about your sad, hard, difficult, beautiful country, Bo is that Jesus shines so much brighter and clearer against all that Dark. And just when we think He can’t get any brighter… through your words, He does. Thank you for sharing His Shine. Karla - First, let me say I absolutely LOVE that photo of Steve. It’s so him! Secondly, thank you for loving my cousin so well. Hugs to you. Nancy RN - Bo – Thank you for sharing your heart – your comments are deeply moving and inspiring as well. Will you please contact me? God is seen in what you write, but more in how you live! bo - Thank you so much, Jane. Love to you! bo - Bless you, Karla – we’re so grateful for our amazing family! bo - Thank, Nancy. Yep, I’ll shoot you an email. bo - Linda, that was so beautiful. Have you written your story out? I know it would be an inspiration to so many to read about the road that you’ve walked and the unlikely treasure you found along the way. Thank you for sharing it here – it blesses my heart. DeAnn Barnett - I just ran across your beautifully written blog and want you to know that as someone else who has entered that sad, hard, difficult, beautiful country that you now live about a year before you and who also attended the ALS National Advocacy Conference in DC you have touched my heart by your words and in a way that only people in our country can understand. God bless you!! Nita Belles - Sweet Bo, thank you for yours and Steve’s courage to be real in this battle. Truth brings life. Your lives have always been about bringing life and hope to so many, ALS has given a megaphone to the beautiful and deep love and truth you already have been living. I am blessed to be near you in this battle…24/7 Love you. Sue Gawler - Bo, thank you for the moving description. I wish I had had a chance to meet you there. If you’re on Facebook, I’d be glad to be your friend- I’m easy to find (especially until end of May while I have ALS Awareness Month as my pic). Best to Steve. bo - Hi Sue – yes, I would have loved to have met you. I’ve heard Oregon and Maine are similar states and I’d like to do my own research and visit someday. 🙂 I’ll find you on fb. In case my aging mind forgets – just click on the fb button on the front page of my blog. 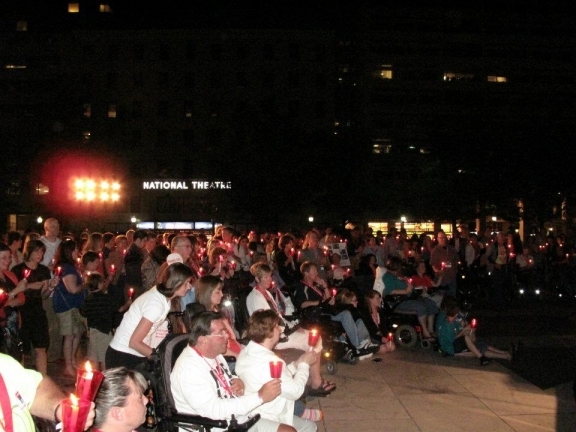 I’m so sorry you’re living in the land of ALS – please know you’re not alone. Thank you for a most exquisite portrayal of this year’s Advocacy Day and Public Policy Conference. I am a Roman Catholic Priest. My classmate and closest friend was diagnosed nearly four years ago. I am his primary care giver. I became a member of the Board of our CT Chapter and this year the National BOR. Like all we try to do everything we can in whatever way we can contribute to finding a cure. In my current parish several have subcomed to the disease and one currently in their last struggles. I remember all who face this, caregiver as well those fighting so couragiously, at every Mass I celebrate. When my classmate was forced to retire his first question was what will his ministry be now? Our whole identity is tied to our work. He concluded his struggle would be his ministry. Keith Regan - Thank you for sharing your feelings and your belief in Him. bo - Thank you so much, Fr. Kelly. What a fantastic work you are doing. On behalf of my beloved and myself: thank you for caring so much and for serving with the compassion of Jesus. I think my husband would agree with your friend: walking this journey out with grace, strength and hope is a worthy and wonderful ministry, it’s just not the one he would have chosen. bo - Thank you Nita…24/7. Lori Averett - I read your stories and appreciate the two of you more and more with each addition of this journey. We are taught that turmoil should be turned into praises….your turmoil shows me God’s work in the relationships we are to have in this world. The love that two people can share through anything, good and bad. I believe that is the journey I see. Not just the disease you are fighting but the love that you are building, the foundation that you are building in this world not just in your family but in the people, like myself that know you and love your love. That is what God designed us for, was too love one another and the two of you are great models of this, and I thank you!